In terrestrial predators attacking from ambush, most common vertical slit pupils, while their victims, herbivores, slit pupil often oriented horizontally. Scientists explain this pattern different purposes of the two groups of animals. Vertical pupil allows predators to see sharper vertically oriented objects, such as their victim, herbivore, on the contrary, it is necessary to survey the wide horizons in time to notice a predator, so their pupils are often adapted to ensure that the horizontal lines are sharply visible. The pupil regulates the amount of light falling on the retina. In addition to the round pupils, the lumen of which is determined by the circular muscles – sphincter of the pupil, in the nature of frequent slit-shaped pupils are provided with an additional pair of muscles. 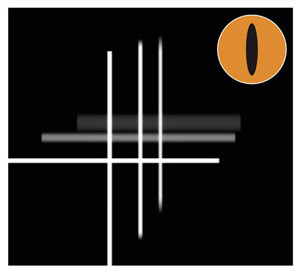 The range of the slot-like clearance pupil wider than that of a round: the area of ​​the vertical pupil cat can vary 135 times, and the round pupil person – only 15. Therefore, slit pupils useful for animals that are active during the day and at night, a wide range of lighting conditions. After all, the day when the light, the pupil should not miss too much light, and at night it is, on the contrary, should be as wide as possible to the retina fell out, and more so the small number of photons. But the gap pupil can be oriented in different ways – vertically or horizontally. Scientists from Durham University and California have recently suggested that the orientation of the pupil is not random and depends on the lifestyle of the animal, and the objects in the visual field, which is especially important for him. They compared the shape data 214 pupils terrestrial species to their way of life (Fig. 1). 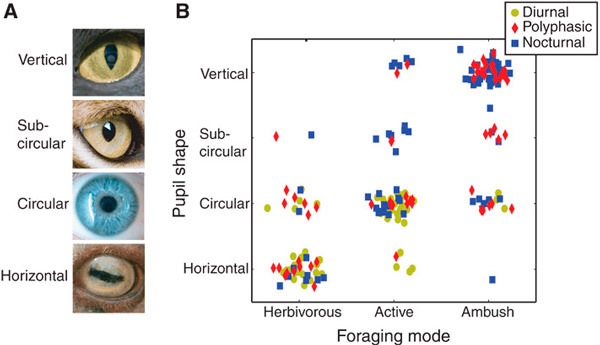 It turned out that the pupils herbivores are mainly oriented horizontally in active predators most common round shape of the pupil, and the predators that lie in wait to ambush the victims, most of the pupils are oriented vertically. The shape of the pupil and depend on the period of daily activity: nocturnal animals often pupils were slotted than round. Regularities found corresponded very stringent levels of significance, so had to understand what the reasons explained by the difference in the shapes of pupils of different groups of animals. When the eye or the camera focuses on a certain point, the rest of the image becomes blurred. The diameter of the blur circle around a specific point of the visual field depends on the difference between the distance to it and to the point on which the eye is focused, and the diameter of the pupil. If the pupil is not round, the cutting depth of the visible space will be different for different directions. For example, an animal with a vertical pupil will sharply enough to see not only the vertical line on which it is focused, but also vertical lines located farther or nearer the focal length. But to the horizontal contours of a pupil adapted worse and horizontal lines on which the animal itself is not focused will be very blurred (Fig. 2). In animals with a horizontally-oriented slit-shaped pupils is the opposite: they see a sharp horizontal contours, and to perceive vertical objects adapted not so good. The benefit of a particular form of the pupil depends on the height at which the animal’s eyes are placed. It is easy to understand, considering the photos taken with different distances from the subject, the closer to the surface of the camera is, the higher the gradient blur that is not in focus (Fig. 3). Therefore, if we compare, for example, a cat and a man, the cat is much more important to correct motion blur, because it is “closer to the ground” than people. For these reasons, scientists have suggested that animals smaller growth slit pupils are more common, and this hypothesis was confirmed when researchers analyzed data on the size of the animals from their sample. Interestingly, birds pupils almost always round, with one exception – at the skimmer vertical slit pupils. This exclusion is suitable for theoretical calculations of researchers because of lifestyle skimmer reminds terrestrial predator of small stature. This bird is flying very low at the surface of the water, preying on fish, so that all concerns about the vagueness of the image on which the face at close range, hold for skimmer. Why the eyes of predators attacking from ambush, better able to see the vertical line, and their eyes herbivorous victims, on the contrary, are set to horizontal contours? One can only assume that the predator is more important to see the victim (which is more like a vertically oriented object), and the victim, on the contrary, it is necessary to survey the wide horizons, which must be clearly visible to her in time to notice the threat. In addition, the victim need to determine the direction of where to go, and you need only predator chasing the victim, and the surrounding open spaces is not very interested. Various forms of the pupil several times independently during evolution occurred. It turns out that some form of pupil in animals with different ways of life – this is an example of convergent evolution, when the useful life sign parallel develops in organisms other than the closest groups. Fossil remains of two primitive mammals found in the mid- and late Jurassic deposits of northeastern China, showed that the Jurassic beasts were more diverse than previously thought. One of the new species led a burrowing lifestyle and remotely resembled a mole; the second lived in the trees and looked like a modern squirrel or tree shrews. Both species belong to dokodontam – a dead-end branch of the basal mammals consisting in a more distant relationship with placental and marsupial than the platypus and echidna. Apparently, many adaptations, such as the reduction of the lumbar ribs, and phalanges have evolved independently in the different groups of mammals based on the same genetic mechanisms. 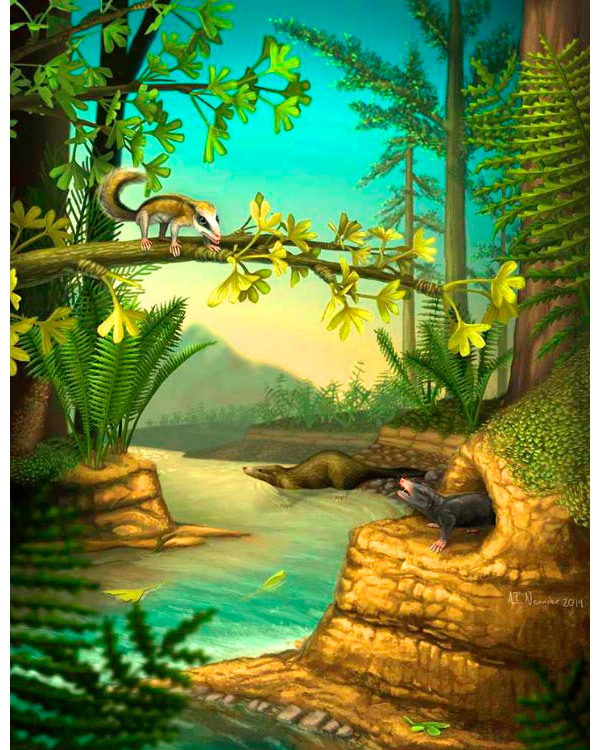 It was once thought that almost all Mesozoic mammals were small, inconspicuous and monotonous, like shrews. However, the findings of the last decades, many of which were made in China, denied this view. “Elements” talked about some of these discoveries, including the amazing waterfowl “bobrohvoste» Castorocauda from the group dokodontov (Docodonta), which resembled an otter Borba and both could eat fish (see ref. At the end of the news). Chinese and American paleontologists reported in the latest issue of the journal Science just two remarkable finds made in the north-east of China. The findings showed that the ecological and morphological diversity of Jurassic mammals were even higher than previously thought. Both new kind as mentioned above bobrohvost refer to dokodontam. This group, according to many experts, is one of the deadlock (who left no living descendants) basal branches, separated from the common trunk mammal before, the latter divided into the ancestors of modern monotremes (platypus, echidna) and terievyh (marsupials and placental) . However, there are others, including radically different versions of the classification of mammals and their ancestors (see . : MF Ivakhnenko. 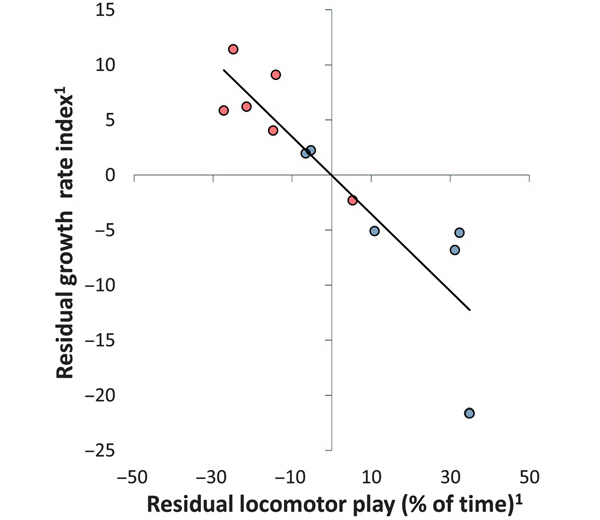 The problem of transition Theromorpha – Mammalia). 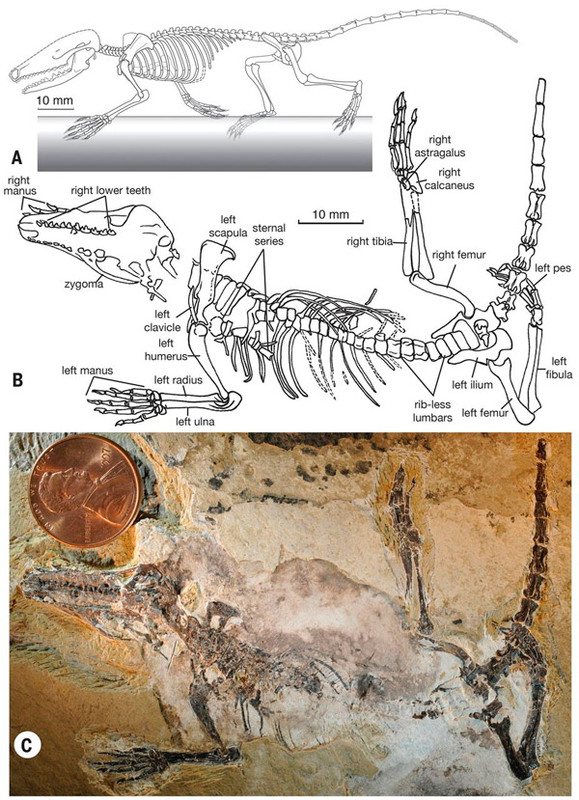 The first of two newly discovered animals called Docofossor brachydactylus, meaning “digging shirokopaly dokodont.” His bones were found in Late Jurassic deposits, Hebei Province (Fig. 2). Dokofossor – mammal a length of about 9 cm (from nose to base of tail) and weighing 13-17 In the structure of the skull and teeth are, on the one hand, primitive features characteristic of other mammalian basal (mammaliaform, mammaliaformes), on the other – specific features characteristic of modern burrowing animals such as marsupial moles and golden mole. The most convincing evidence in favor of digging lifestyle revealed in the structure of the limbs. Paws dokofossora – a specialized foot underground dweller. In particular, his fingers are made up of only two phalanges (instead of three, as in most ancient and modern mammals), and the terminal phalanx enlarged, expanded like a shovel, and a special projection at the base prevents the terminal phalanges folded back. All this – typical signs of burrowing animals. For example, reducing the number of phalanges is typical for modern golden mole, fingers that look like fingers dokofossora (Fig. 3). This is a typical example of a parallel evolution, i.e. forming an independent similar adaptations in different groups of animals, in this case – at basal mammals (dokodontov) and placenta. The authors suggest that the basis for such convergence are common genetic mechanisms responsible for regulation of the limb development in embryos of terrestrial vertebrates. At the golden mole in the course of embryonic development in the future fingers formed the beginnings of the three phalanges, but then two of them (the proximal and middle) merge. In mice and humans the same phenotype (merger phalanges) sometimes occurs because of the disruption of the gene regulatory cascades that control tab of the joint between the phalanges. 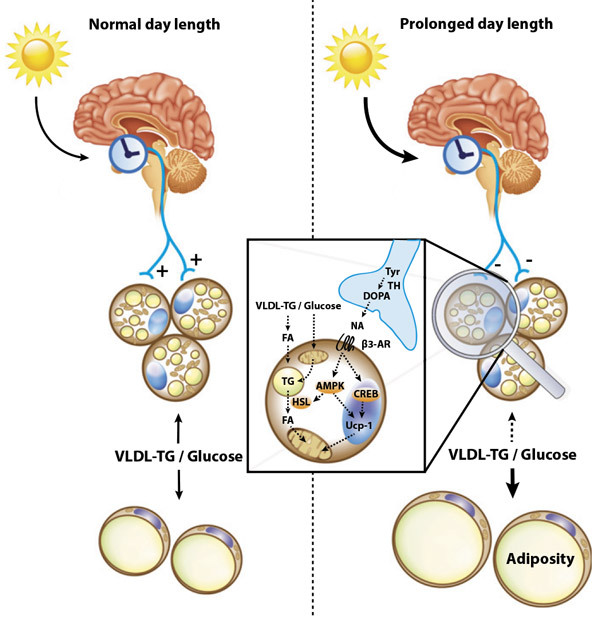 Among the regulators involved in this process include proteins BMP2 (bone morphogenetic protein 2), GDF5 (growth and differentiation factor 5) and several others. 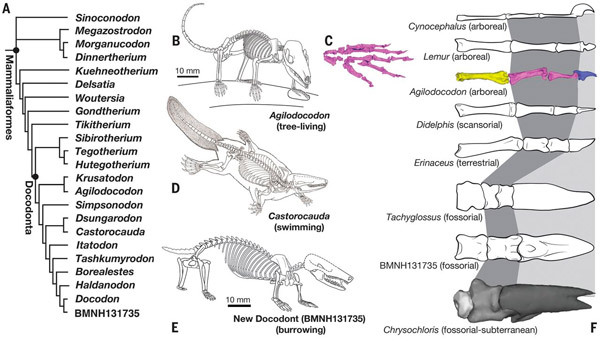 These regulators are likely to manage the development of fingers and Jurassic mammals, and similar variations in their work caused by mutations that lead to a similar phenotype changes – for example, to merge the phalanges. Likewise, it explains the parallel evolution of another important feature – lumbar ribs and lumbar spine. Modern mammals lumbar vertebrae ribs there, and lumbar spine morphology clearly different from the breast-carrying ribs. Loss of lumbar ribs and separation of the lumbar considered an adaptation associated with increased mobility and flexibility of the back of the body and the intensification of respiration. According to the fossil record, in different groups of early mammals reduction of lumbar ribs (partial or complete) occurred in parallel and independently. New findings have shown that this is true for dokodontov. In dokofossora, Castorocauda and other dokodontov has lumbar ribs, the size of which gradually decreases as it approaches the sacrum. It seems, the original (ancestral) condition tag for dokodontov and all mammals. However, the second newly discovered dokodonta, agilodokodona (See below.) Lumbar ribs No lumbar clearly distinguished from breast. This implies that the evolutionary lineage dokodontov, as in the other groups of early mammalian occurred independent reduction lumbar ribs. The reason lumbar ribs easily lost, and sometimes may appear again, presumably lies in the fact that the genetic regulatory cascade manage bookmarks of ribs in embryogenesis, the same for all mammals. 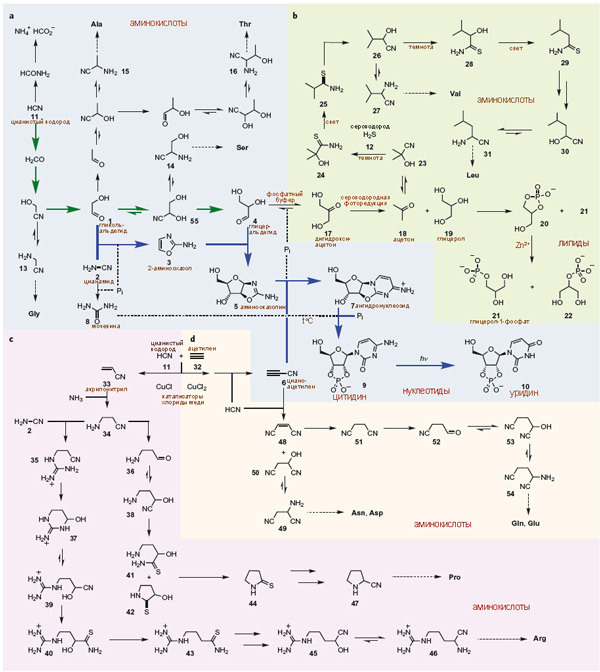 A key role is played by genes Hox9, Hox10, Myf5, Myf6 and others. 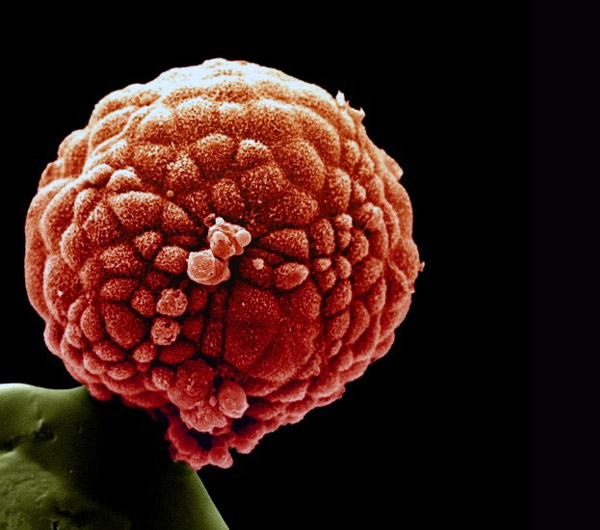 Changes in the work of a small number of genes may be sufficient for a radical change in phenotype. For example, you can get the mouse embryos developed lumbar ribs, if you turn off all three copies of the gene Hox10 (see . : New fossil discovery sheds light on the early evolution of mammals, “Elements”, 17.03.2007). 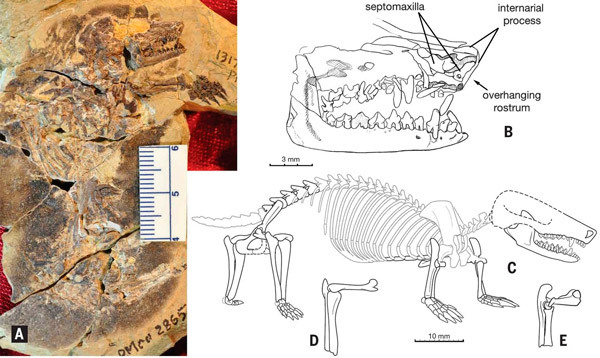 The second ancient mammals, called Agilodocodon scansorius («agile dokodont climbing”), found in the Middle Jurassic of Inner Mongolia (Fig. 4). This dokodont was also small (14 cm from nose to tail, the weight of 27-40 g). Judging by the structure of the spine and extremities, agilodokodon was well adapted to climbing trees. In particular, the proportion of his fingers point to the arboreal (Fig. 3). All other known dokodonty were either ground or floating (bobrohvost), or, as we now know, digging. Thus, the finding broadens understanding about the range of environmental adaptations dokodontov. The structure of the teeth agilodokodona indicates a mixed diet, which included not only insects and other small animals, but plant foods. On grounds such as the shape of the molars and the relief of the surface, similar to agilodokodon some lemurs, lorises and Galago – primates eat insects, fruits, gums, and plant juices. The similarity with primates can also be seen in the structure of the paws (Fig. 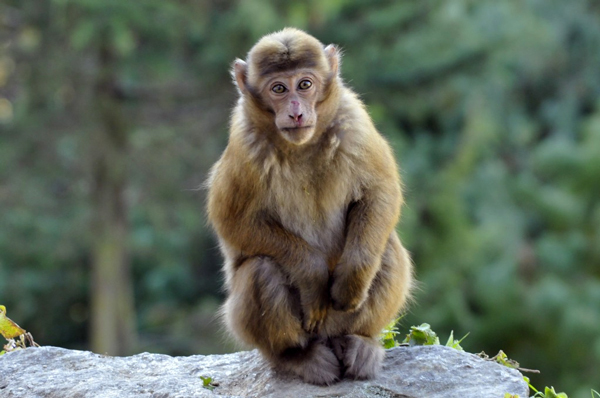 3), which is not so surprising when you consider that primates – originally a group of wood. Other dokodontov in the structure of molars is not so clear-cut signs of adapting to plant foods. Cutters agilodokodona have an unusual shape: they look like a wide, pointed at the end of a shovel or a spoon, strongly convex on the outside (from the mouth) and concave on the inside (by the language). The authors note that the incisors are similar in some American monkeys: marmosets, spider monkeys, howler. These monkeys are used for gnawing incisors bark to get to the juice and sweet selections. Apparently agilodokodon also earn their living in this way. New findings have shown that the ability to convergent evolution of similar systems of life forms and the parallel development of the same sets of ecological niches is typical not only for the “higher” terievyh mammals (marsupials and placental). This ability has had basal mammaliaformy who had to “invent” its lemurs, otters, moles and long before the heyday terievyh. New discoveries have allowed to clarify the understanding of the early evolution of the human race. 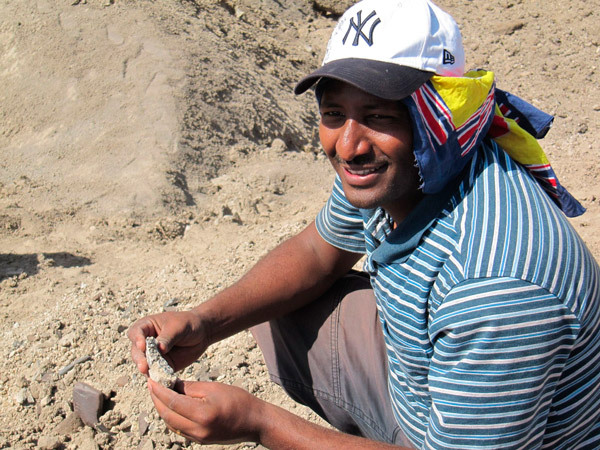 In the Afar region (Ethiopia) in the sediments of age 2,80-2,75 million years found a fragment of the lower jaw, referred by American and Ethiopian paleoanthropologists to the genus Homo. Until now, the oldest find of Homo considered upper jaw AL 666-1 age of 2.33 million years. Meanwhile, another team of anthropologists from the United Kingdom, Germany and Tanzania pereizuchila type specimen of Homo habilis (OH7, age of 1.8 million years) and came to the conclusion that early Homo still better to refer to three different species (H. habilis, H. rudolfensis and “early H. erectus»), but not to the same polymorphic species, as suggested by scientists studying early erectus in Dmanisi (Georgia). Three alleged species differ in the structure of the jaws and teeth, but hardly distinguishable on such an important feature as the volume of the cranium, which has been extremely volatile in all three. Either way, the new data show that the genus Homo appeared and began to diverge earlier than previously thought. The results of two major paleo-anthropological studies published in early March in the journal Nature and Science. Both works shed light on the early stages of evolution of the human species (Homo). The article of the British, German and Tanzanian anthropologist, published in Nature, are considered new, more accurate reconstruction of the type specimen Homo habilis OH7 (age of 1.8 million years), found in 1960 at Olduvai Gorge in Tanzania. Studied material includes a slightly deformed lower jaw with teeth and two fragments of parietal bones. The authors studied the priceless discoveries using X-ray computed tomography. Understand the structure of posthumous cracks and deformations, scientists reconstructed the shape of the jaw and parietal skull with the maximum possible accuracy. Comparing the reconstructed jaw (Fig. 2) with other known jaws of early Homo and Australopithecus, and modern humans, chimpanzees and gorillas showed that jaw OH7 «primitive», that is, has a number of archaic features, brings it closer to Australopithecus. This applies primarily to the shape of the dental arch (Fig. 3). For jaw OH7 characterized by long, almost parallel rows of premolars and molars. This suggests a strong prognathism. In other words, the jaw of the individuals on the monkey came forward. Meanwhile, the known finds of early Homo, including those older than OH7, whose jaw had a more “human” appearance. For example, the upper jaw AL 666-1 age of 2.33 million years old, which is still considered the most ancient finding Homo, dental arch is shorter and wider and the tooth rows are not parallel but diverge like the more advanced members of the human race. Statistical analysis of the variability of the shape of the dental arch in various representatives of humanoid showed that early Homo range of variability for this trait greatly exceeds anything that can be observed within the same species in modern apes, including humans. For example, the jaw KNM-ER 1482, traditionally assigned to the species Homo rudolfensis, different from OH7 almost as much as the jaw of modern man from the jaws of chimpanzees. After analyzing the pairwise intra- and interspecific differences in dental arch form in different hominids, the authors came to the conclusion that on the basis of early Homo is quite clearly divided into three clusters, which they tend to be interpreted as three different species: Homo habilis, Homo rudolfensis and early Homo erectus (the latter includes, in addition to the African finds, also people from Dmanisi). In this case the shape of the dental arch habilis more “monkey” (almost to a greater degree than in the Afar Australopithecus), while rudolfenzisov and erectus – more “human” (Fig. 3). Thus, the authors of the article under discussion do not agree with David Lordkipanidze and his colleagues, who on the basis of new data on the skulls from Dmanisi suggested to be one of the earliest Homo choppy sea (see Fifth . 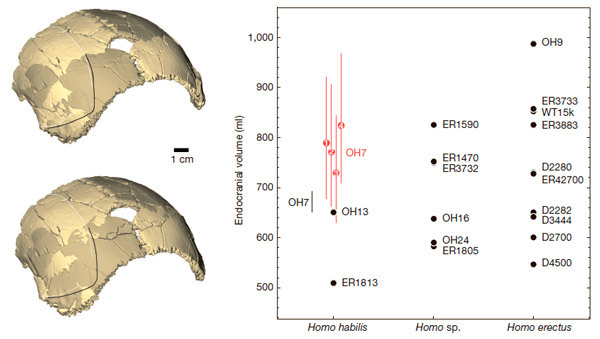 : Dmanisi skull showed enormous scope of individual variability of early Homo, «Elements “10/21/2013). Of course, this conclusion should not be considered final. It is based on a small number of finds and morphological characters. In addition, not all the findings of early Homo fit well into the proposed scheme. For example, the authors note that copies OH65 (1,6-1,8 million years) and the aforementioned AL 666-1 (2,33 million years), usually referred to H. habilis, too much different from the type specimen and OH7 They fit into their concept habilis. These instances are also deprived of the specific characteristics of the front part of the skull, characteristic of H. rudolfensis. The authors admit that they may be, must reconcile with the earlier erectus, but abstain from the final conclusions and leave the question open. The researchers also calculated the volume endocast (inner cavity of the skull) OH7 based on surviving fragments of the parietal bone. The calculations are based on two alternative ways of parietal reconstruction of the skull and two ways of calculating the volume of the brain in the form of this section, with the result that happened four digits. All are in the range from 729 to 824 cu. cm, which significantly exceeds the previous estimates (647-687 cu. cm) Thus, OH7 had a very voluminous (at the time) the brain, which, oddly enough, combined with the powerful, strongly raised “monkey” jaws. This combination of features is not very consistent with the known hypothesis that the weakening of the jaw and chewing muscles in early Homo was an important prerequisite for the growth of the brain. New data, along with the previously obtained show that early Homo was characterized enormous range of variability in terms of the brain. 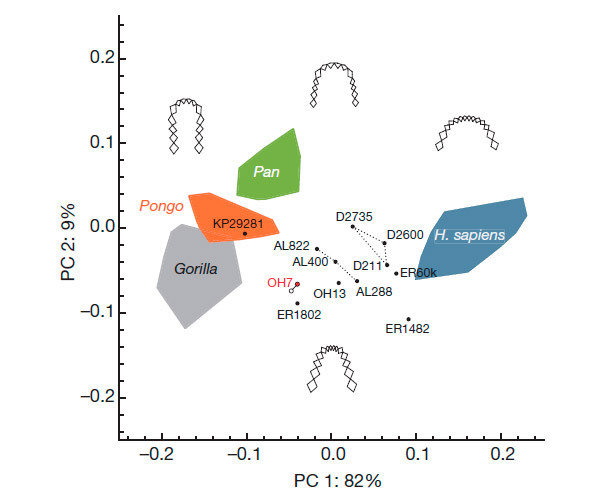 Alleged ‘species’ early Homo on the basis of indistinguishable: the ranges of variability almost entirely overlap (Fig. 4). These results are somewhat changing ideas about the early evolution of the genus Homo. Anthropologists will long debate about the classification of these forms and how you combine them into a single view or share a few. From an evolutionary point of view it is a question not of principle. In any case, one can hardly assume that early humans lived at the same time in the same territory in East Africa, divided into distinct, reproductively isolated groups that never crossed each other. Apparently, we have a typical picture of the initial stages of rapid morphological divergence, like barbs (barbels) Lake Tana (14 shapes formed there in less than 30 000 years, some ichthyologists consider different types, others – a kind) or cichlid large African lakes (see . 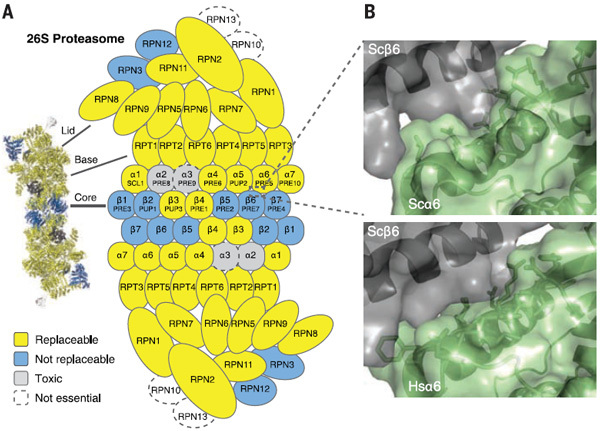 : The genomes of African fish clarify the mechanisms of rapid speciation, “Elements”, 09.29.2014). Moreover, this divergence was due to start long before the era when he lived OH7. It should, in particular, from the fact that the jaw OH7 more ancient primitive jaw AL 666-1. So, already 2.33 million years ago, most likely at the same time there were representatives of the human race, vary greatly in the form of the dental arch. Apparently, a common feature of all populations (or species) of early Homo was a high variability in the size of the brain: some individuals are almost did not differ in this parameter from the ancestors, Australopithecus, while others were much more brainy. 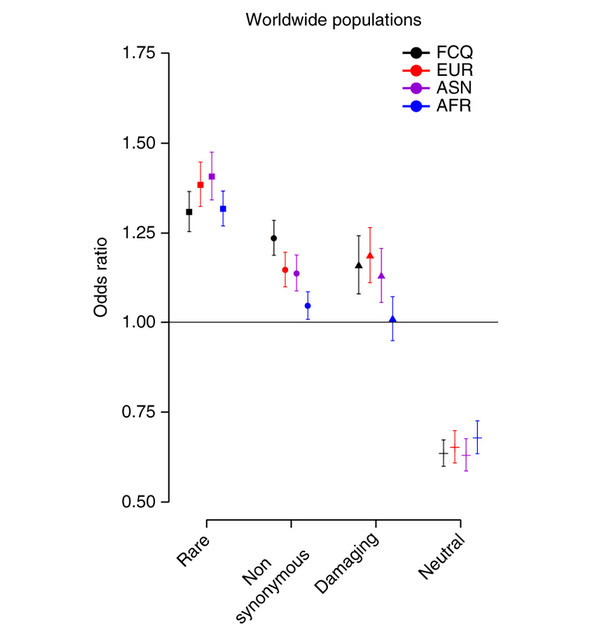 The assumption of an early start of the divergence of the genus Homo is consistent with the new discovery, described in the article of anthropologists from the United States and Ethiopia (Fig. 5). 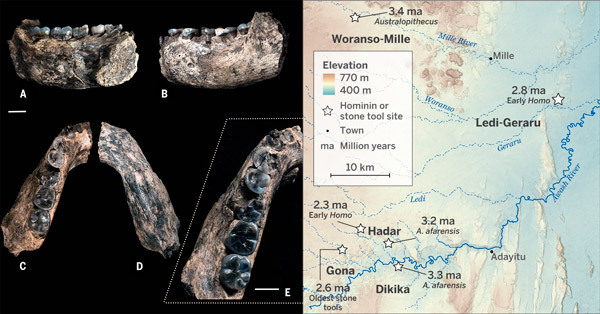 A fragment of the lower jaw of ancient Homo was found in January 2013 in the region of Afar (Ethiopia), at the seat of Ledi-Geraru, which still did not find fossil hominids, despite diligent search. In the 30-40 km from this place are the famous location Hadar, dikika and Gon, which found numerous fossil remains of australopithecines and early Homo, as well as ancient tools 2.6 million years of age. The deposits, which are found in the jaw, enclosed between two layers of volcanic tuff, which managed to date by radiometric methods. These dating, along with biostratigraphic and paleomagnetic data allow reliably determine the age of the jaw: 2,80-2,75 million years. Thus, the owner of the jaw later lived past Afar Australopithecus (the youngest finds of A. afarensis have an age of about 3 million years old) and much earlier than the oldest Homo from Hadar (2.33 million years). Of course, a piece of jaw with six teeth (canine, two premolars and three molars) – it is a little. But the bone and teeth are well preserved, which allowed researchers to more or less convincingly justify their bold decision include the discovery of the genus Homo (rather than Australopithecus). Authors scrupulously sorted differences between their findings, which received the code name LD 350-1, from the Australopithecus (especially from A. afarensis, which find a marked similarity) and Paranthropus. Most of the features that distinguish a copy from the LD 350-1 Australopithecus, brings him to the people. The most important features are shown in Fig. 6 where the jaw LD 350-1 is compared with the jaw A. afarensis. Australopithecus mental foramen (mental foramen), serving for the passage of nerves and blood vessels (indicated by the red arrow), opens up towards the front and at the bottom of recesses on the side of the jaw (edge ​​recess is outlined in yellow dotted line). At LD 350-1 groove is missing, the corresponding portion of a convex surface, and the mental foramen was called back (as many Homo). In A. afarensis branch of the lower jaw (ramus mandibulae) – large angular plate extending upward from the body of the bone – begins opposite the second molar (M2), whereas the LD 350-1 cutting edge branch shifted back and begins in front of the third molars (M3 ). In addition, the height of the jaw LD 350-1 is approximately the same throughout (as in most Homo), while in the most massive bone Australopithecine front (has a greatest height bicuspids) and tapers behind (under its height lower molars). There are other signs that indicate proximity to Homo. These include the nature of the attrition of tooth enamel and the slope of the outer (buccal), the edges of the molars: in Homo these edges are nearly vertical, Australopithecus, usually beveled. The shape of the dental arch at the LD 350-1, judging from the debris was primitive, about like H. habilis OH7 (but not like older AL 666-1). Despite the differences from Australopithecus and some resemblance to Homo, jaw LD 350-1 is hardly a typical jaw early Homo. It has archaic features and is different from habilis jaw and rudolfenzisov. According to the authors, this jaw looks exactly as it should look like the jaw of a transitional form between Australopithecus afarensis and later people like habilis or rudolfenzisy. So LD 350-1 could, if desired, be attributed to the genus Australopithecus (and certainly there is no guarantee that other parts of the skeleton of the Undiscovered individuals were just as “human” as the lower jaw). A similar dilemma faced by paleoanthropologists whenever forms are transitional between previously isolated genera and species. Making Choices sometimes have to almost throw a coin, although scientific articles and is not accepted to write about it (see . : Australopithecus sediba – Australopithecus, like the man, “Elements”, 15.04.2010; note that a decisive argument in favor of the classification A . sediba australopithecine was a small cranial capacity, the size of the brain have been the owner of the jaw LD 350-1, unknown). Nothing so vividly and clearly shows no loyalty to the Darwinian idea of ​​gradual evolution, like those suffering paleoanthropologists trying to draw clear boundaries between the transition smoothly into each other’s views. Apparently, already 2.8 million years ago, some Australopithecus, similar to A. afarensis, began to evolve into a “human” side – at least in regard to the shape of the jaws and teeth (which they had arms, legs, brains and behavior, we do not know). With this idea in agreement previously found scattered teeth of similar age, including eight teeth KNM-ER 5431 (2.7 million years) of Koobi Fora in Kenya. If this hypothesis is confirmed by new findings, and indeed it appears that early Homo descended from A. afarensis, you have to admit that some similarities with humans, marked by later representatives gracile australopithecines, such as A. garhi especially A. sediba, is the result of parallel evolution. Judging by the concomitant fossil fauna, the alleged ancient man lived LD 350-1 in an open and fairly dry place, like a modern African savanna, possibly with gallery forests along the banks of reservoirs. This follows from the abundance of herbivorous mammals and the lack of wood. The possible presence of gallery forests indicate bone deinotherium; fossil of fish, crocodiles and hippos show many ponds. These data are consistent with the accepted views on the importance of climate change and the spread of savannah in the origin of man (see . 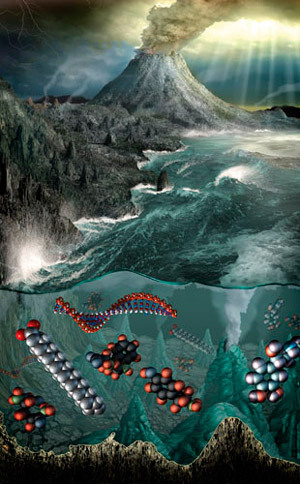 : The influence of climate on human evolution is confirmed, “Elements”, 07.02.2011).